Today was our first excursion with snowshoes. The shoes were purchased last year and as of yet, we hadn't tried them. I was wary going out with a group of young students. However the trek was almost trouble free. Nothing compared to what I remember with previous groups and different shoes. The weather was beautiful, sky was clear, and the snow was deep! Perfect to be out! 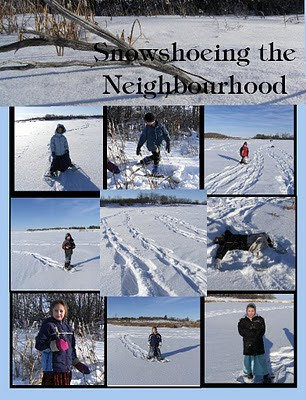 We were able to explore areas that in summer are under water and in winter the snow too deep to venture in.